30,000 children killed. 100,000 arrested without trial. 22,000 expelled. 150,000 exiled. Its 1973 in Chile and President Salvador Allende, the first socialist democratically elected in a Latin American country, had begun his reign. We are told the story of a snapshot of Latin American history through the eyes of two eleven year old boys. Pedro is a poor boy from a pueblo background brought into an upper class private school during Chiles brief socialist era. Gonzalo, a young boy from the opposite end of the spectrum befriends Pedro against the bullying will of his class mates of whom he has also been a target. In doing so his eyes are opened to a raw, complicated world he barely knew existed outside his sheltered life. Through these very young sets of eyes we see Chile drift towards a civil war as protest marches fill the streets. Amid all this Gonzalo must also deal with more personal problems which can seem insignificant to some. His promiscuous mother is having an affair with a wealthy older man and his father lacks the will to fight for their marriage. As the two boys grasp their friendship the insight into one anothers lives shows an enormous rift which becomes impossible to bridge. Once the military coup capsizes the nation the children suddenly have to face tests beyond their naïve capabilities as the film surges to a tear jerking finale. 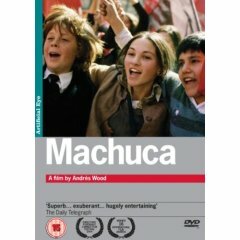 Although Machuca may have more of an impact of Chileans who experienced the coup directly, its a theme of young people caught in the swirl of events beyond their understanding which resonates far beyond the details of this single moment in history. Through realistic imagery, giving the film an almost documentary feel, I was able to feel their pain, opening my eyes into another reality. Woods directing is assured, showing a love of his country and history in a polemic but not preachy manor. We are given a balanced view of each side of social class, giving us a better understanding of why and how things happened. just not for us". Whilst Pedros fathers speech to his son demonstrates the reality people are faced with in the shanty towns. you will still be scrubbing toilets". The story itself works as a metaphor for the innocence of the people at the time. An innocence that was lost over an over.